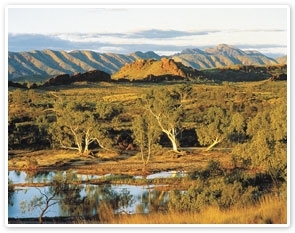 This morning you’re headed for the beautiful West MacDonnell Ranges. While driving through amazing outback scenery, your Driver Guide will point out significant landmarks and share details of the region’s history and rich culture. Founder of the Flying Doctor Service and the Australian Inland Mission, Reverend John Flynn made a significant contribution to the provision of critical services in the outback. One of many memorials across the Northern Territory in his honour, the John Flynn Memorial Historical Reserve located seven kilometres west of Alice Springs, is the site where he was laid to rest. Learn from your Driver Guide of his selfless vision to connect the outback community with essential services and Christianity. First stop, the incredible Simpson’s Gap. Surrounded by towering cliffs, Simpson’s Gap is one of the best known destinations in the ranges and features a number of walking tracks. Walk through Simpson’s Gap to the waterhole, keeping an eye out for the elusive black-footed rock wallabies hiding among the rocks. Late morning you’ll arrive at Angkerle. Here you can take a walk along the stony watercourse and take in the rich plant and birdlife along the way.